When the 49ers open rookie minicamp Friday, it will be the coaching staff’s first chance to see rookie receiver Quinton Patton of Louisiana Tech. Patton, a fourth-round pick in the recent NFL draft, is considered a good bet to make the 49ers’ opening-day roster, perhaps as a slot receiver. But the receiving corps that Patton is joining is suddenly a deep one, with expected starters Michael Crabtree and Anquan Boldin, 2012 No. 1 draft choice A.J. Jenkins, Mario Manningham, Kyle Williams, Chad Hall, Ricardo Lockette and perhaps even B.J. Daniels, the South Florida quarterback taken in the seventh round who might be given a chance to play as both a wideout and kick returner. It’s possible, however, that with all the big names and draft picks vying for a roster spot, a dark horse might emerge: Lockette. This offseason, the former undrafted Seattle Seahawks receiver and college track standout at Fort Valley State has been impressing his teammates and coaches. Lockette was signed to the 49ers practice squad last season after his release in September by Seattle. He saw only limited playing time for the Seahawks in 2011, and had just two career catches in two games on the team’s active roster. But those two catches were for big yards, a 44-yarder against San Francisco and a 61-yard touchdown catch against Arizona. Lockette, the 49ers’ tallest receiver at 6-foot-2 and 211 pounds, has spent much of the offseason working out with quarterback Colin Kaepernick in Georgia, where Lockette is from. He’s also been soaking up the playbook and working out at the 49ers training facility, trying to do everything he can to make the team. Lockette’s biggest asset is his speed. He has 4.37-second time in the 40-yard dash and was the NCAA Division II national champion in the 200 meters in 2008 with a time of 20.6 seconds. 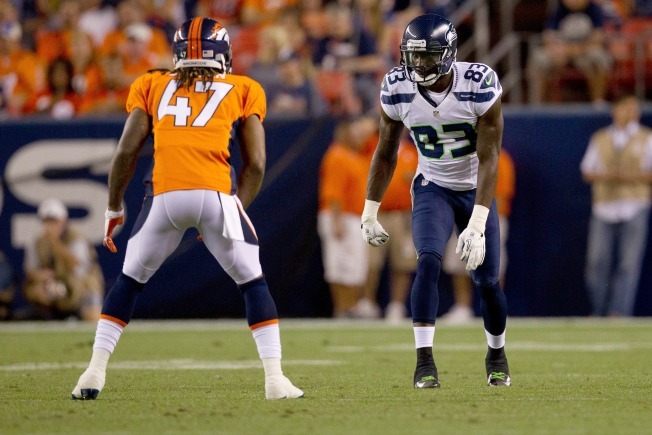 Niners head coach Jim Harbaugh believes Lockette has the potential to be a big-play receiver. “There is something special there, I can feel it,” Harbaugh said in March. Lockette was disappointed when he was let go by the Seahawks but now believes he has an opportunity with the 49ers and wants to make the most of it. Working out and getting close with Kaepernick this offseason can only help. Back in March, Lockette showed his mindset about his goals for 2013, when he posted a quote by Michael Jordan on Twitter.